Research associate Oxana P. Lazarenko uses quantitative real-time PCR to find differences in bone formation gene expression in response to various infant formulas. For millions of American infants, a bottle of warm, soy-based baby formula is what’s for dinner. It’s also what’s for breakfast, lunch, and all those between-meal feedings, as well. At least, that’s the routine for a healthy, soy-fed baby’s first few months of life. After that, baby may be ready to handle solid foodâ€”purÃ©ed fruits and vegetables, for instance. At the USDA-ARS Arkansas Children’s Nutrition Center in Little Rock, principal investigator Jin-Ran Chen, M.D., is taking a close look at the effects that soy formula, cow’s-milk formula, and mother’s milk have in regard to development of strong, healthy bones. As lead scientist in the center’s Skeletal Development Laboratory—and a father of two—Chen has a keen interest in this often-debated subject. “Very little is known about the short- and long-term effects of soy formula on bone health,” Chen points out. 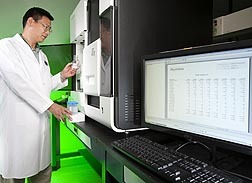 For this extensive experiment, Chen and colleagues used a range of leading-edge technologies, such as peripheral quantitative CT (computed tomography) scans, which take actual measurements of bone interior and exterior, and real-time reverse transcription polymerase chain reaction assays (real-time RT-PCR), which enable the scientists to analyze expression (turning on) of genes that play a pivotal role in bone formation. The study encompassed more than a half-dozen well-established indicators of bone quality and quantity (mass), making the investigation one of the most detailed of its kind. In general, the work “suggests that soy-formula-fed piglets may have the best quality bone,” says Chen. The research also suggests that soy may enhance bone formation by directly affecting the BMP2 (short for “bone morphogenesis protein”) signaling pathway. Signaling, or messaging, initiated by BMP2 and targeted to other bone-forming molecules along the BMP2 signaling pathway “is absolutely essential for building and reforming bone,” Chen says. Though scientists have known of the existence of a BMP2 signaling pathway for several decades, details are still being uncovered. Chen’s study was the first to spotlight soy’s relative influence on initiating BMP2 signaling. • had greater bone mineral density and bone mineral content, two key indicators of bone strength, at 21 or 35 days after birth. • formed bone at a faster rate. • had a greater number of osteoblasts, specialized cells that become functioning bone cells. • had a lower number of osteoclasts, cells that, in a process known as “resorption,” break down bone so that calcium and other bone minerals can be used elsewhere in the body. Chen collaborated in the work with Thomas M. Badger, center director, and Martin J.J. Ronis, a principal investigator there. 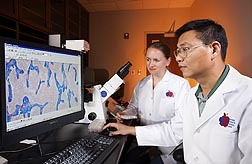 All three are also members of the research faculty at the University of Arkansas for Medical Sciences in Little Rock. Also collaborating were center research associates Jamie V. Badeaux, Michael L. Blackburn, and Oxana P. Lazarenko. Their findings are documented in a 2009 article in the Journal of Nutrition. “Breastfeeding is recommended by the American Academy of Pediatrics,” says Badger. “Milk-based formula is the second choice, and soy formula is third. Although 62 percent of U.S. infants were breastfed as newborns in 2008, 73 percent of those transitioned to infant formula between birth and age 6 months. In all, it’s estimated that about 20 percent of formula-fed infants are fed soy protein-based formula during their first year of life. Identifying the potential benefits or adverse effects of these early nutrition choices is important. We need a better understanding of their impact on growth, development, nutritional status, promotion of health, and prevention of disease. We believe the findings from our studies are improving our understanding of early nutrition and will help pediatricians, parents, other researchers, and policymakers make informed choices.”—By Marcia Wood, Agricultural Research Service Information Staff. This research supports the USDA priority of improving children’s nutrition and health and is part of Human Nutrition, an ARS national program (#107) described at www.nps.ars.usda.gov. Jin-Ran Chen and Aline Andres are with the USDA-ARS Arkansas Children’s Nutrition Center, 15 Children’s Way, Little Rock, AR 72202; (501) 364-2707 [Chen], (501) 364-3301 [Andres]. "Building Baby’s Tiny Bones: Formulas and Mother’s Milk Analyzed in Animal Study" was published in the January 2012 issue of Agricultural Research magazine.